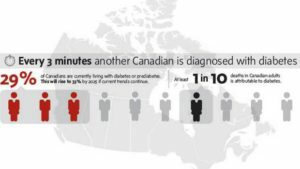 More than one in four Canadians are living with diabetes or prediabetes. What’s more alarming is that this number will rise to more than 1/3 by the year 2020. I am not a fan of stats but when you put it in that sense it will be easy to take a look at your circle of family and friends and realize that this stat is true. Diabetes is such a complex health condition that affects everyone; adults, children, seniors, pregnant women and their unborn child. The simple definition would be to label diabetes as the body’s inability to manage its blood sugar levels. But why can’t the body do so? The pancreas in the body produces a hormone called insulin. Insulin helps to control blood sugar levels by signalling the muscles to take up blood sugar and use it as energy. So let’s take a look at the types of diabetes first to get some insight into how complex this condition really is. Type 1 Diabetes occurs when the pancreases no longer produces any insulin or produces very little insulin. Usually this type develops in children and affects about 10% of the total population who live with diabetes. Type 2 Diabetes occurs when the pancreas does not make enough insulin required to manage blood sugar levels. Type 2 diabetes is also caused by the cells inability to use the insulin that is produced (insulin resistance) as you can see it starts to get complicated from here. This type of diabetes usually occurs later in life and affects 90% of the individuals who live with diabetes. Type 2 diabetes can stem from unhealthy diet and poor lifestyle choices. Pre-diabetes refers to an elevation in blood sugar levels which are higher than normal but not high enough to be classified as type 2 diabetes. Through proper diet and exercise pre-diabetes can be reversed unlike clinical diagnosis of type 2 diabetes. There are many risk factors associated with diabetes (type 2 as it is most prominent). Family history of diabetes, especially close relatives like a parent or sibling. Gender- males are more at risk. Certain ethnic groups are more at risk than others. High risk groups include; Asian, South Asian, Aboriginal, Hispanic, and African descent. Age- particularly over the age of 40. Previously diagnosed with impaired glucose tolerance (prediabetes). Being overweight, especially if the weight is distributed around your waist. Having high cholesterol or fats in the blood. History of gestational diabetes (diabetes during pregnancy) or giving birth to a baby weighing more than 9 lbs. As you can see there are a few risk factors that you have no control over such as your family, ethnicity, age and gender. But there are many risk factors that correlate directly to your lifestyle, therefore by changing your habits you can reduce your risk of diabetes by 60%. Exercise as always is the best treatment and unlike medication it has minimal side effects but the key with prevention is early detection, by ignoring the signs you are putting yourself at more risk. If you or someone you know is at risk, don’t wait around. Come in to Trainsmart Wellness and talk to a Registered Kinesiologist to learn how we can help you on your journey to better health. Book your free no obligation consultation here to get started.